Cree LED Lighting CR Series 2 -Light architectural LED troffer in white color, features durable 22-gauge steel housing. 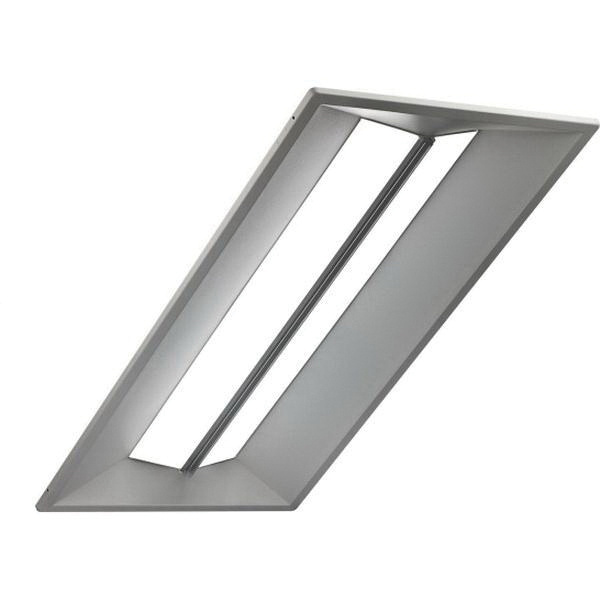 This LED troffer in rectangular shape, uses two 40-Watt LEDs that have voltage rating of 120 - 277-Volt AC. Lamp in the LED troffer has color rendering index of 90 and color temperature rating of 3500K to ensure optimal light level in the surrounding. LED Lamp offers 4000-Lumens of bright light output. It comes with angled reflector for uniform distribution of light. It measures 47.7-Inch x 23.7-Inch x 4.75-Inch. Troffer features a step dimming control. Recessed mountable LED troffer in textured high reflectance white polyester powder coated finish, comes with 75000 hours of average life span. An unique combination of reflective and refractive optical components achieves a uniform, comfortable appearance while eliminating pixelation and color fringing. It comes with t-bar clips and holes for mounting support wires that enable recessed or suspended installation. It has efficacy of 100 LPW. This LED troffer is ideal for indoor use. LED Troffer is UL/cULus listed, RoHS compliant, DLC and FCC certified.